This post describes how to install Tomcat 6 on an Ubuntu 10.10 server and connect it up with the Apache2 server using the jk module. Although there are plenty of posts about this, none gave a full list of instructions; this is what I aim to provide - let me know if you have any corrections. I assume that you have Apache2 installed. You will need to do most of the following actions at a root shell prompt. Get this from your login using: sudu su - You will need to edit various text files. You can do this using vi at the shell prompt. However I usually do this on my local computer using my preferred editor, transferring files to and fro using FTP. You will now need to reboot so these changes are used. Tomcat should now be running on port 8080 at your host, eg http://www.example.com:8080/ If you go there, you should see an It works page. To test it further, I put a JSP file in here: /var/lib/tomcat6/webapps/ROOT/ and saw that it ran OK. I then put a servlet WAR file in /var/lib/tomcat6/webapps/. This was soon expanded automatically by Tomcat and I was able to navigate to the servlet directory (still on the 8080 port). You should now be able to access these apps at /manager/html and /host-manager/html. You will need to enter your credentials; possibly a couple of times on first access. The Tomcat logs are at /var/log/tomcat6/. By default Tomcat creates a different log file for each day. Keep an eye on these, and the disk space they consume. Hopefully you already know these commands to test your Apache configuration and restart Apache. You'll need these later. An alternative is to define JkMount commands in jk.load and add a JkMountCopy command to copy these settings to all virtual hosts. I was now able to access the Tomcat manager here: http://www.example.com/manager/html. Edit your other VirtualHost files to expose any other apps that you need. You'll find the Apache and jk logs in here: /var/log/apache2/. As above, keep an eye on these files and the disk space they use. If you see "missing uri map" in log file mod_jk.log then you need to define JkMount in your VirtualHost. As a final task, if you wish, disable the Tomcat 8080 port by editing /etc/tomcat6/server.xml and then restart Tomcat. I've previously blogged about Wandering drive letters in Windows 7. I've now a little more hard-won knowledge of what's going on. Be very careful if you resize a Windows 7 system partition when the partition letter is not C. In fact, don't do it! I am revisiting this issue because I ran into a problem. Our family shared laptop came with Vista. However this started playing up showing a DOS box regularly and Windows Update wouldn't install a particular patch. So I decided to install Windows 7 on drive D. This worked fine with W7 running with its system drive as D:. Recently, drive D: started getting full so I decided to resize the partitions with the great Partition Wizard. This seemed to go OK. However, Windows 7 started playing up very badly, showing DwmHintDxUpdate error messages and worse. I eventually tracked the problem down to the fact that Windows 7 had decided that drive D: would now be called drive C: which is a serious problem as Windows and other software will store many full file locations (in the registry and elsewhere). If W7 thinks a file should be on drive D when in fact it is on drive C, then there's going to be serious problems. It's amazing that it booted at all. The post by MarcusOS7 here explained what was going on, ie that Windows 7 tries to rename its system partition to drive C if the drive is resized, ie when the drive identifier changes. This is a serious flaw in Windows 7 and must be fixed. I had hoped that with this information, I would be able to mend my W7 system. Even though I could just run regedit, I did not know what magic to do to change the system drive letter. Eventually I decided to reinstall Windows 7. I saved the data over to an external USB drive. For this installation I wanted to be sure that W7 would install itself on drive C. Previously I must have done the installation when running the Vista system which somehow prevented W7 from using the C drive. This time, I was careful to do the install after booting into the Windows DVD. This trick ensured that W7 marked its install partition as drive C (even though it was not on the first partition). In fact: before doing this, I re-partitioned the system so I had 3 partitions in the laptop, one each for Vista and W7, and one as a data drive. This process also helped me clear the previous W7 installation which was quite stubborn to remove, permission-wise. I eventually had to clear the partition by reformatting the drive. Suppose you have a Drupal staging site where you are preparing to go live or testing new features. You could install this on a separate domain that you have. Here's how to redirect casual users to your live site, while giving those in the know easy entry. The crucial trick is to use a Session variable to indicate an authorised user. All Drupal access is via the root index.php file (except use of static files). index.php is amended to redirect users who do not have the session variable set correctly. Another secret file eg password.php, is used to let you get into the site by setting the session variable. In the following example, www.example.com is your live domain and www.example.info is the staging server. The following code is on the staging server. Use this tool if you want to find a Google Maps KML GLatLng location, eg to use within your own code: http://www.phdcc.com/GoogleLatLng.htm Either drag the initial marker or enter a search term. The latitude and longitude values are listed below, to 6 decimal places of accuracy. The map is centred on the UK, as this is where I will want to use it most. It uses the Google AJAX Search API to work out UK postcodes well. Look at the source to see how it works. In DNN5, code that calls DotNetNuke.Entities.Users.UserController.GetUser() etc will return a UserInfo object even if the user is deleted. Therefore you may have to check the UserInfo.IsDeleted property every time you get a user. I would have not have implemented it this way. I'd keep the DNN4 functionality and have extra API calls to find deleted users. I wonder: does the DNN core code always check IsDeleted now? 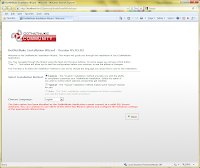 Anyway, UserInfo.IsDeleted is not available in DNN4. As I do not want different versions of my code for DNN4 and DNN5, I have written this isUserDeleted() static method that uses reflection to detect if the IsDeleted property is available and if so calls it. It returns true if the UserInfo is null. After that, for DNN4 it always returns false. This is primarily a technical article - for usage instructions, see the above link. Freegle is a network of local re-use groups in the UK. Group members give away and receive any unwanted items for free. This helps conserve the world's resources, clears clutter and helps others. The Find a Group tool shows a UK map with pinpoint markers for each Freegle group. You can move around and zoom in as normal - clicking on a marker shows an information bubble - clicking on the link in the bubble takes you to the group web site. The green group markers come from this KML file - maintained by another Freegle member. This is the latest data so the tool should always be up to date. Actually, that's not the whole truth. The tool needs to load the KML file into memory so it can search for groups. Loading the above Google Maps KML link doesn't work because of cross-site scripting security (as I understand it). Therefore the code loads a separate snapshot of the KML file from a URL that it can access. The Find a Group tool occupies a full web page here: maps.ilovefreegle.org. The Find a Group tool appears in the Google mapplets directory here. When added to My Maps it shows filling the browser window. The Iframe version of the Find a Group tool is designed to fit into a small window within another page. The usage instructions describe the various configuration parameters. You can see the iframe in action at the Penrith and Eden District Freegle group and its associated helper web site. The Find a Group tool is packaged as a Google Gadget, defined here. You can therefore add it to iGoogle, add it to a blog, and get the code to put on a web site. The gadget has similar options to the iframe. The gadget has a Content type of url, with the main gadget code here. The gadget options are passed as URL QueryString parameters. The Find a Group tool is being developed as a simple Facebook iframe application. Input text box called "search"
The search text box has an accesskey of "4" defined. For the larger variants, a label is defined for this text box. The tool HTML is hopefully valid XHTML and CSS. To use the Google Maps API, each site needs an API key. All these tools run on the maps.iLoveFreegle.org domain so the iLoveFreegle.org API key is used. The mapplet code does not need an API key. This takes parameter specifying whether big map controls are wanted, and the mapplet boolean. If the "jsBlock" page element is present, change its display style to block to make it show. Get the map object and set the map height if it has been specified in a parameter. This parses the received KML XML file and stores info about each Group placemark object in the Groups array. Note that the KML file stores each coordinate the wrong way round, ie longitude, latitude then height. The GLatLng.fromUrlValue() function needs just the first two values but reversed. Once the KML is loaded, it sees if a search has been requested and does it. The search function does a Google GClientGeocoder search and zooms in to show the result. The search also lists the nearest groups, calculated using GLatLng.distanceFrom(). doSearch() uses showAddressResult(), SearchGroups() and createMarker(). String.prototype.trim, PageQuery, queryString() and isInteger() were obtained from code on the Internet. I added queryString2() helper function. I have updated PageQuery to cope with URL parameters with key=value pairs where "=value" is missing. If you are trying to use an Access MDB file using the Microsoft Jet OleDb driver in .NET or ASP.NET, you must set your platform target to x86 (32 bit). The Microsoft ACE.OLEDB driver for MDB and ACCDB files works OK whichever platform is targeted. However this driver is not installed by default on user computers unlike the Jet driver. This fix can be used to make existing code work with Jet/MDB, eg the Cassini server. In .NET, a string (System.String) can contain an initial UTF-8 Byte Order Mark (BOM) which might not be seen in ordinary processing but is present when converted to a character array or into an encoding byte array. If the file contains these 7 bytes (in hex) EF BB BF 44 65 61 72 then content will superficially contain the single word "Dear", eg as seen in the debugger, and content.StartsWith("Dear") will return true. However, content.Length is 5 and content.ToCharArray() will return an array with 5 elements, the first being set to 0xFEFF. Similarly, Encoding.UTF8.GetBytes(content) will return the same 7 bytes as was used in the first place. Here's a XHTML/CSS technique to ensure you only clear the desired floats and get the right background areas for your DIV. The code examples are here: http://www.phdcc.com/CSS_ClearingFloats.htm - look at the source code for full details. My starting point is to have a DIV set with floats left and right. Within the middle unfloated DIV, I have another DIV set with floats and right. I want to clear just the middle floats, not the outer ones. The crucial trick is to add CSS style 'overflow:hidden' to create a Block Formatting Context. Any CSS style 'clear:both' then only applies to the 'nearest'/current Block Formatting Context. An associated problem was the fact that the background of the middle unfloated DIV goes wide to the border of the current Block Formatting Context. Adding CSS style 'overflow:hidden' to create a new context constrains the background to the expected area. Using 'overflow:hidden' feels slightly naff: shouldn't there be an explicit CSS style to define a Block Formatting Context, instead of using something that does this as a side effect? Also, you may be concerned about what overflow is being hidden - as long as you have the default width:auto and/or height:auto set, you will not be hiding anything. 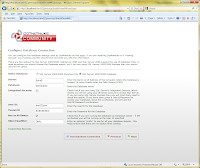 This page explains how to add "access key" support to a DNN5 web site. For standard users, each browser uses different modifier keys and acts minorly differently when pressed. Consider accesskey '1'. In Windows Internet Explorer, pressing Alt+1 selects the corresponding link - you must press Enter to go to that link. In Firefox, pressing Alt+Shift+1 goes to the associated link immediately. These accesskey shortcuts take precedence over standard Window commands, so if you define an accesskey 'f' it will be acted on rather than show the File menu in Windows. In Internet Explorer, the link is not selected if the link has a style of display:none. Most of the access keys can be defined in your DNN skin using extra HTML that is not normally seen. However, accesskey 4 takes you straight to the Search text box. To make this happen, I had to amend admin/Skins/search.ascx to add AccessKey="4" to the txtSearchNew asp:TextBox. CSS (below) can then be used to make sure that this information is not normally seen, but each link become visible when it has the focus or is active. The list-style is set to none to avoid bullet points etc. When not in focus, the links have width and height 0; when in focus these are set to auto. Tweak the other settings as you wish. 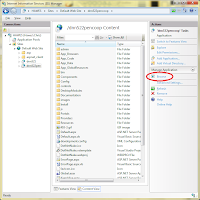 The post summarises the steps required to set up DotNetNuke 5 (DNN5) locally on Windows using the full Microsoft SQL Server using SQL Server authentication, ie not the Express version. Getting the Logins and Users right is the crucial trick that I want to remember. 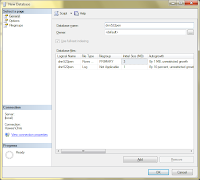 In Microsoft SQL Server Management Studio, connect to your local server. Right-click on Databases on the left. Select "New database". In the following screen, enter a database name, eg "DNN522pen" and click OK without changing anything else. 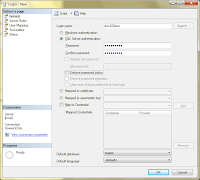 Enter a login name such as "dnn522pen", select "SQL Server Authentication" and enter the password. Untick "Enforce password policy" if you wish. Do not set the Default database. Click OK.
Next, create a new folder on disk somewhere, eg in directory "D:\dnn522pen\". Unzip the DotNetNuke community installation file in there DotNetNuke_Community_05.02.02_Install.zip. Open up Internet Information Services (IIS 7) Manager. 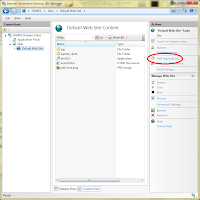 Expand the menu on the left to open Sites and Default Web Site. Click on "Add Application..." on the right. Enter the database name, eg "dnn522pen"
If desired, enter a database table name qualifier, eg "DNN_"
Click on "Test Database Connection"
Proceed with the rest of the DNN installation as normal. 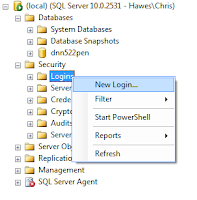 I am in the process of porting some (DNN module) tables from one Microsoft SQL Server database to another. For various reasons, I want the primary key identity column values to remain the same. This is on a shared SQL server, so we don't have admin access, eg to the command line and file system. The SQL Server Import and Export wizard transfers the data nicely and will preserve the identity values if you do it correctly. 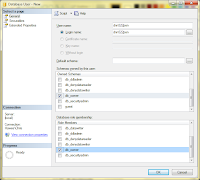 - in the wizard, click Edit Mapping and tick Enable Identity Insert. I first export the original data to a temporary database. This creates the tables but but does not create primary keys, set default values etc. However, the copy process does preserve the original primary key identity column values. By installing the DNN module on the destination system, the tables are created correctly there. However, a wizard import into these tables (even with "Enable identity insert" set) does not preserve the key values. The trick I found is to upload the data into a new table eg "Form2", and then use the following code to copy the data into the correct "Form" table. The trick is to use the "set identity_insert" statement. You must list all the required columns in the insert statement. Only one table can have identity_insert on at a time. Finally, delete the "Form2" table. My main computer's motherboard died - long live the new computer! Thankfully, all the data on the two existing drives were OK. A hastily bought 3.5 inch USB drive caddy worked a treat, keeping me going on the laptop. The new computer was pre-installed with Windows 7 Home Premium on drive C with a separate partition on drive D for data. I have an MSDN subscription and I wanted to set up various versions of Windows multi-booting on the same computer. I have two different systems that I want to run normally, one with Visual Studio 2008 and the other with various older bits of software. I also want to have some different versions of Windows for software testing, ideally Windows 7, Vista and XP, both in x86 and x64 versions. OK - I know I can run a virtual PC, but I want to use two of these systems regularly at top speed. I haven't tried virtual PC yet, so I decided to stick with what I knew, which is the HyperOs multibooter, though I had to upgrade to the latest version. The first task was to repartition the disk, to give more partitions, each with a Windows installation, as well as big photo/video partition. I found that there were already two extra partitions, a (Packard Bell?) Recovery Partition and a small System Reserved partition set up by Windows 7, ie 4 Primary partitions in total. The W7 Disk Management tool wanted to convert my disk to Dynamic Disks to give me more partitions, but these cannot be used for booting, so a swift exit was called for. HyperOS mentioned the Acronis partitioner but this wasn't playing - not sure if it was Windows 7 or the size of the disk. I did have a copy of gparted on CD, but this hadn't worked for me before. Eventually I found Partition Wizard www.partitionwizard.com which has worked brilliantly. I got a free commercial licence for this. Having done that, I could now copy all my precious data onto the new hard disk from the drive caddy. Anyway, I've now done various Windows installations, some by installing from DVD from Windows, but mostly by installing from DVD at reboot, ie choosing DVD at boot up from the BIOS boot menu - and choosing Custom Setup to choose the install partition. The problem that I have found is that the drive letters that Windows uses and sees seems to change a lot. The original W7 system is on drive C on the "first" partition. I have another W7 on the fifth partition which thinks of itself as being on drive M - fine. However, most other W7 and Vista installations think of themselves as being drive C, even though they are on partition 4, 7 or 8. When I have rebooted in one of these systems, the drive letters are assigned in a fairly random way. The DVD drive is usually drive E but not always. In Windows Disk Management you change the drive letters - for some drives at least. But there's limited scope for what you can change to. Partition Wizard can do this, and is probably more successful. However there appears to be no way of persuading a Windows on partition 4 (that thinks it is at drive C) to think of itself as being drive L for example. All these wandering drive letters might not be problem. However my software development stuff and business data has always been carefully set up (for various reasons) to be stored on both drives C and D. I don't tend to put data in "My Documents", "Documents", "Pictures", etc because these are (usually) stored in different locations for each version of Windows. Anyway, I have persuaded partition 2 to be drive D in all the installations so far. However it was a problem that partition 1 kept wandering all over the shop. My solution was to move all my crucial data from drive C onto a bigger drive D. Ok - fairly simple in itself, but I'm still having to work out what dependencies there are in all my scripts. Another complication in this process was that Windows XP was dying during installation (with a BSOD). This turned out to be because the SATA drives were being accessed using AHCI. Changing the BIOS to use the SATA setting "Native IDE" got the XP installation to work. However I did not want to leave this setting as is, so I change it whenever I want to switch to XP. XP also doesn't recognise many of the motherboard peripherals, eg Ethernet, so the installation is not very useful. The option to press F6 during installation would let me install a suitable driver, but (a) I don't have the driver and (b) the system doesn't have a floppy; it does look as though new motherboard has a floppy interface, but there's no connector soldered in there! I was also able to add an IDE/PATA cable and drive to the system to connect my old drives, but the installation still did not work if I was in AHCI SATA mode. I've still many applications to configure and systems to set up, but I'm getting there.